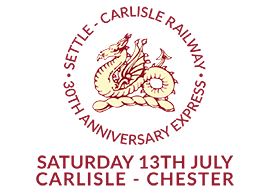 Audio Guides are available which provide a sound commentary for your Settle-Carlisle journey. If you have an iPhone you can download the app, free of charge, from the Apple App Store. Using GPS, the commentary will be synced with your position on the line, describing what you can see out of the window. You’re advised to download the app before you set off on your journey as there is only a limited mobile phone signal available on the line itself. For non-iPhone users, you can download the MP3 audio files below. The trip is split up into sections starting and finishing at stations so if the train is delayed or is running ahead of the commentary you can pause – or fast forward to the next station and restart. At either end there is a commentary on Settle and Carlisle stations. These recordings are available as MP3 files. Download an MP3 audio file by right-clicking on a link and selecting ‘Save Target As’ (Internet Explorer) or ‘Save Link As’ (Firefox). Save the file to your music folders and transfer onto a portable MP3 player to take on your journey.